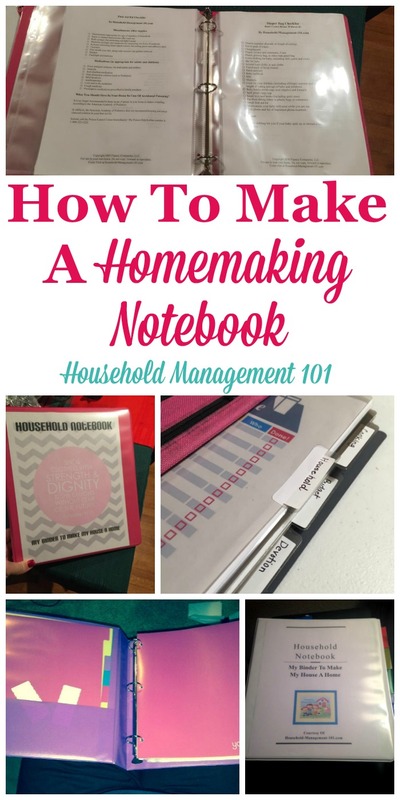 A homemaking notebook, to actually be useful, does not need to be complicated. In fact, the more complicated it is the less likely you will make it and use it. Simplicity is the key. Just as there are lots of ways to become organized and efficient, there are lots of ways to create and maintain your household notebook. Once you start using your household notebook your system will evolve, and eventually your system will be uniquely yours, suited best to your family's needs. That is OK. In fact, that is ideal. Therefore, when I refer to a "homemaking notebook", or "home management binder," or any other term you use for this collection of vital information for your family, I am speaking more in the abstract sense. Your system, at least once firmly in place, can be a centralized binder or lots of different lists and documents in various locations throughout your home, in both paper and electronic format, or any combination in between. 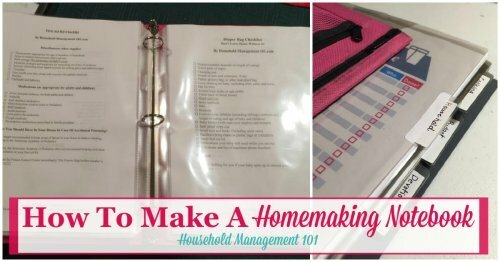 Do you want to be the only person who uses your homemaking notebook, or do you want others in your household to also use it frequently? There is no right or wrong answer to this question, but you need to consider it to determine what type of household notebook will be right for your family. Let's use the example of a family calendar. If you want the whole family to use it and refer to it, keeping it in your purse at all times is not the best solution. Instead, you may want to put it up on the wall, or if everyone has access frequently to the Internet, you may want to put it online with settings to allow everyone to view and add information to it, as needed. As a general rule my suggestion is to make each portion of the household management notebook available to as many persons in your household as possible, as appropriate. The reason for this is that it allows every person to feel like part of the team, and to be more involved in making their house a home and keeping the whole family running smoothly. It also keeps anyone from having an excuse that they didn't know what needed to be done, or where certain information was, that kept them from acting. 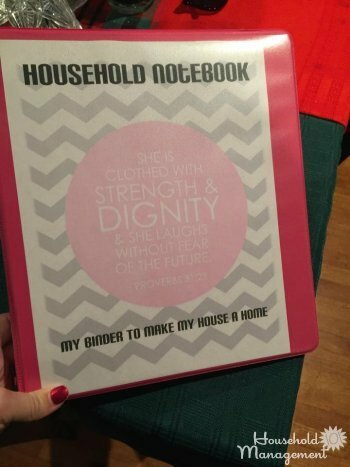 Another question to consider before you begin making your homemaking notebook is, how will you use it? An example here is a coupon organizer. I once bought one that came highly recommended, a very large binder. It did organize my coupons quite well, but I came to realize it did not fit my needs for how I wanted to use it. I like to carry my coupons around with me at the store. You never know when you will see a good deal that becomes even better with a coupon you already have!!! The problem was that I didn't want to lug around that big binder while I did my grocery shopping. It did not fit in my purse, and if my child was sitting in the grocery cart I couldn't place it in there either. Thinking about how I wanted to use it before I purchased it would have been better. I would have realized something small was the better way to go for me, and chosen something more suitable. Another reason I want you to understand that when I use the term "household notebook" I am speaking in the abstract, is because there are some things that should be in your household notebook, but they are not pieces of information that you would want to share with the general public, such as your credit card account numbers or internet passwords. Therefore, even though I have listed these items in the general contents of the household notebook, I would not suggest carrying them around with you in the grocery store, for example. They should stay some place safe and secure at all times, but accessible to you when needed. For example, for such items, you may have a folder in your filing that contains this information, but I would still consider it part of your homemaking notebook. Household management binders got their name because lots of people organize their household management information into one or more three-ring binders. 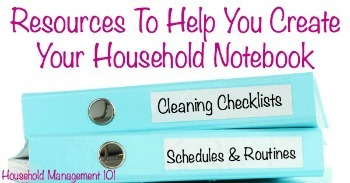 The types of things that can be placed in a three-ringed binder that is on the counter or on an accessible shelf for everyone to reference are things like chore charts, cleaning schedules and laundry schedules. In addition, meal planning, and recipe organizers are also suited to being within a physical binder. What these all have in common are that the activities are inside the home, and more than one family member can participate. There is something to be said, at least when you first start out, for having a physical binder where lots of the information is gathered together. If nothing else, it is a physical reminder to you and your family of your journey towards a more enjoyable home and family. If you are having trouble with being a household manager, I would wait until later to start dispersing your household notebook contents to lots of places in your home, and into cyberspace. At first, I would stick with a physical three-ring binder. Why A Three-Ringed Binder, And Not A Spiral Notebook Or Bound Book? 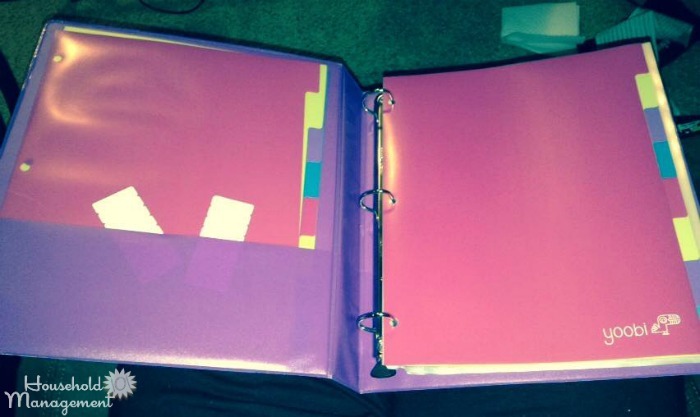 The advantage of a binder over a spiral notebook, for example, is the ease with which you can add and remove pages. Especially at first, when you are learning what works best for your family, and building schedules and routines for the first time, you will change and edit the contents of your homemaking notebook a lot. This makes insertion and deletion of pages quickly and easily a big plus. In addition, life circumstances always change. Your son signs up for tennis lessons, which changes your weekly schedule, or you have a new baby, or your child's class schedule changes, etc., so you will always be modifying and tweaking the contents of your household notebook. I recommend plastic sleeve page protectors for at least your most referenced pages in your household notebook. These page protectors help the pages from getting dog-eared or accidentally ripped out, for one thing. 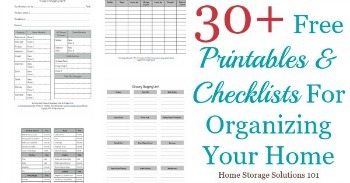 More importantly, though, for pages such as your daily household chores, or your child's morning routine and checklist, having a page protector and a dry-erase marker is a way to check off your accomplishments without ruining the paper. At the end of the day you can just wipe the page protector off, and check everything off again tomorrow without having to rewrite the whole list. Kids love to check things off too (and so do I, and I am sure at least some other adults), so it also helps keep everyone more motivated when they can use a dry-erase marker. Here's an example of a reader, Jena's notebook. 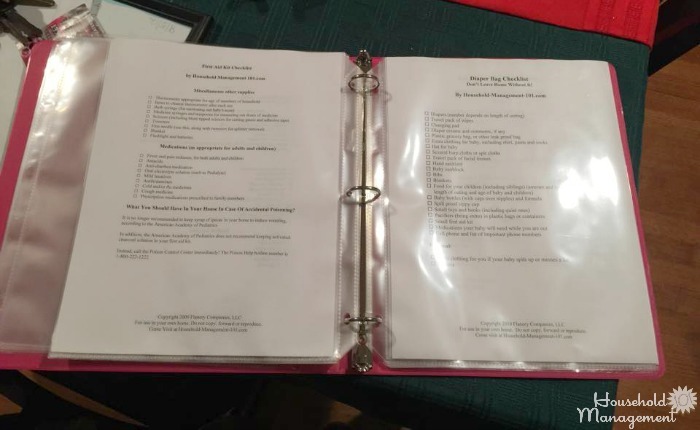 She printed off some of the available printables here on the site, and then put them into a binder with page protectors. 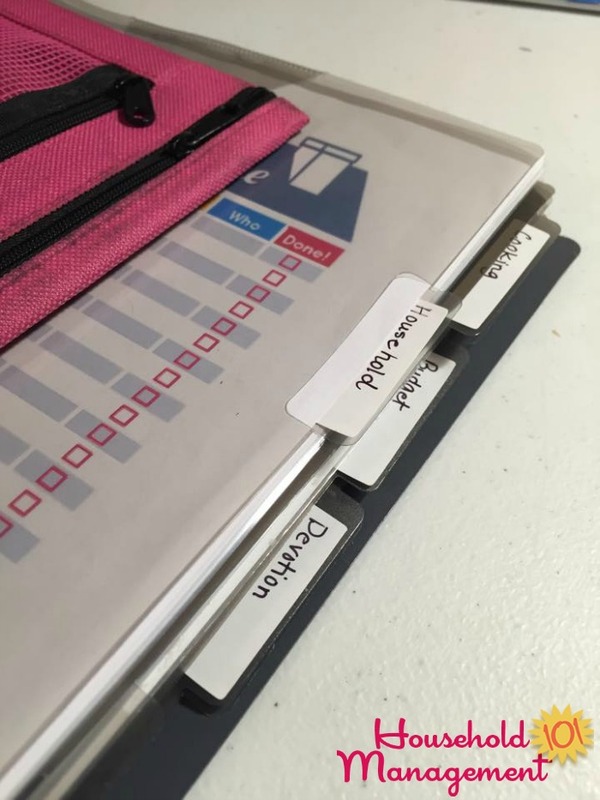 If you have several sections in your homemaking notebook that lots of family members need to reference, putting tabs in the binder can be helpful to allow everyone to find the area they need to reference quickly. That's exactly what a reader, Sandra did, as shown by this photo on the left she sent in. However, I caution that while there are lots of ways to make your notebook more user friendly or attractive, the first goal is that your household notebook needs to be simple. If you do want to get more elaborate with your notebook, make sure these additions add to making it more functional, and that it isn't just a craft project (although I know, who doesn't love a good craft prohect? 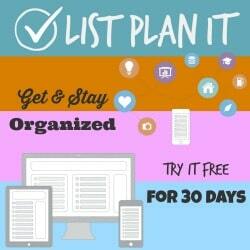 ), because I don't want you to use the task of making such a binder as a way to procrastinate or become a distraction from what you're using it for -- to be the command central for your household. Therefore, I will start this article where I began it. 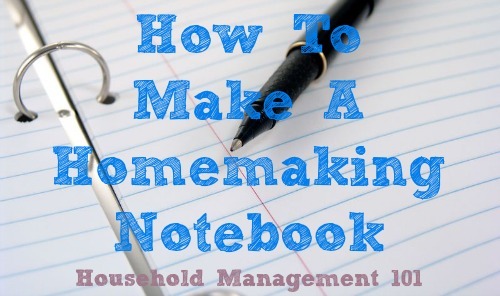 A homemaking notebook, to actually be useful, does not need to be complicated. In fact, the more complicated it is the less likely you will make it and use it. Simplicity is the key. Don't worry if it isn't beautiful or perfect. Build it, and then slowly add to it as needed. That's exactly what a reader, Elizabeth did. She said, "Ready! Empty of stuff at the moment (about to put my packet of calendar in there in a minute), but I'm ready." Want To Buy A Household Notebook? Read below to share how you made your household notebook, and how other readers made theirs, for more ideas. Tell Us How You Made Your Household Notebook! Show off your household notebook, and also help others gather ideas about how to make one for themselves. Please note that the maximum image size accepted is 800x600. If your photo is larger than 800x600 pixels please use your graphics software or a Web-based resizer, such as Google's Picasa for PC users or iPhoto's Export function on a Mac. Click on the links below to see how other visitors created their household notebooks, and what contents they contain. Hopefully you'll get an idea or two that will work for you!